Hi! Welcome to LilacsNDreams! Today I am going to share with you another DIY project that I adore, and hope to do myself. I have a window I found quite some time ago, and hope to redo it to hang on one of my walls. There are so many ways for windows to repurpose them it is amazing. So many creative minds out there, and I am so happy that they share their work for others to see. Also, for many of us to conclude some of our own creative ideas too. Many windows can be found from your home to use, from finds, sometimes you might find them sitting for trash, while you are thrifting, some people will sell them at garage sales, etc. Once you get them you need to decide what it is you would like to do with them. You can use these found windows with, or without window panes, decoupe the windows with designs, post cards, and pictures. Maybe you would like to add a little chicken wire to them to make a memo board, or a jewelry holder. Decorate your bedroom with them as a headboard, or maybe make them room dividers too. You can add the found windows to shelves, or cabinets making them doors. They look nice when shelves are added to the windows too. 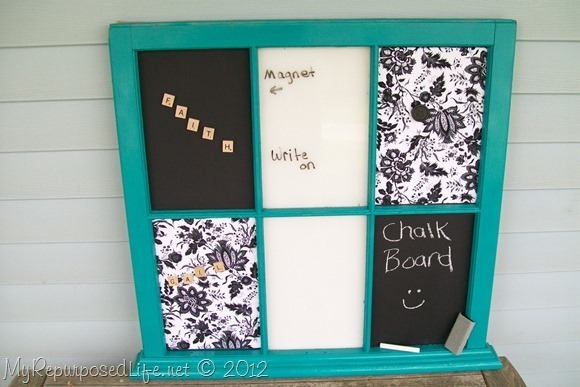 Make some of the popular chalkboards with them, paint and distress windows, maybe you would like to hang the window on a wall with a shutter on each side of it too. So many possibilities, and so much fun too! Below are some pictures I got from the internet, or with pinterest that I will share with you. Just giving you some ideas of the list that was growing above us. Hope it helps you get some ideas of maybe something that will work for you too. This is a distressed window frame, and a picture frame. Some painting, distressing, adding pictures along with some scrapbook paper makes a neat finished product done by this person at xstitchandcrafts blog. 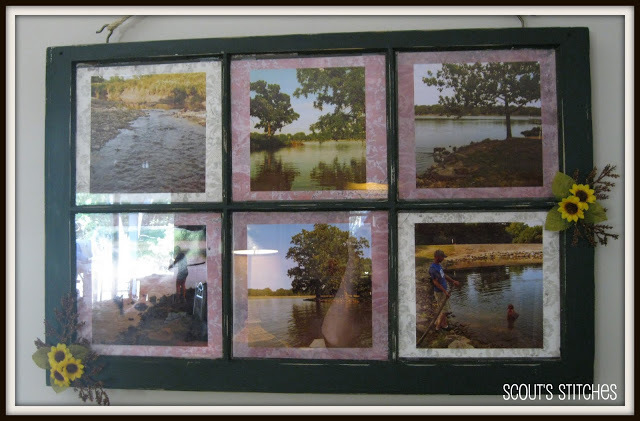 My Repurposed Life is always sharing something, and she did it again with windows and different ways to repurpose them. This is one of the projects she shared with the memo boards, chalkboards, and magnetic boards too. How neat, isn't it? 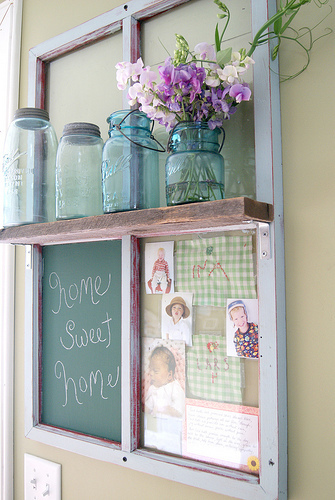 This example of a repurposed window is adorable with the coloring, the shelf that was added along with the chalkboard, and etc under the shelf too. This was shared by pughes-news at tumblr. 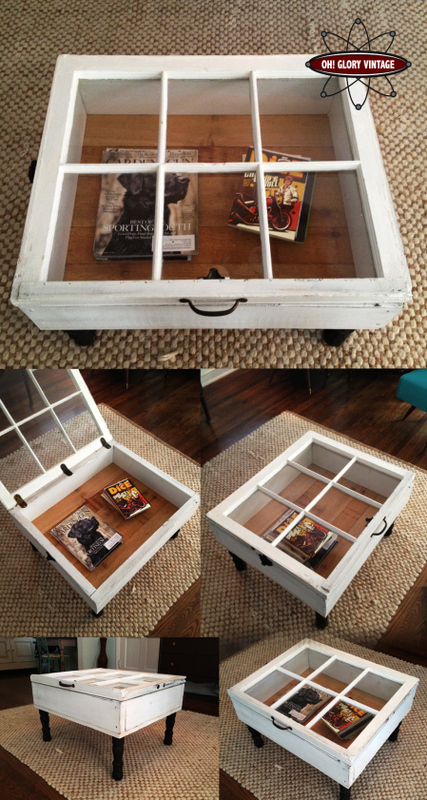 Here is another neat idea to consider with repurposed, and reclaimed windows by making it into a coffee table. This table was made that the door could also be lifted to make changes for the inside display. Oh Glory Vintage did well sharing this with all of us. There is so much more out there that is being shared by many people with the work they have done. Some of them will give you steps, or instructions of what they did to make their projects, and some are only sharing pictures. It sure is fun to look, get ideas, and let our minds be creative with what will work for us in our homes. If you feel venturous make sure to check your search engines with bing, google, yahoo for repurposed windows. There is a lot out there being shared. I hope that you all enjoyed your visit, and this topic that was shared with you today. If you have been thinking about doing a project with repurposed windows I hope that this was able to help with some ideas, and to help with them creative juices to get flowing too. I appreciate you sharing your time with LilacsNDreams, and hope to see you again soon. Take care, and have fun creating everyone! Wonderful post and great ideas! My favorite are the coffee table and the chalkboard with the flowers! Thank you!